The Pierce Universal Dump Bed Kits and Hefty Hoist kits are the perfect solution to convert your pickup into a hydraulic dump truck. 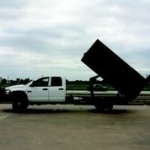 Make your work easier or turn your truck into a money maker! 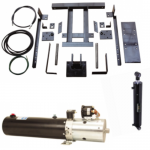 Hydraulic dump bed kits for pickup trucks include a Monarch 12V DC pump with a hydraulic fluid reservoir, hydraulic cylinder, controls and mounting hardware. These items make for an easy transition to a dump truck. 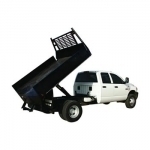 Hydraulic pick up truck dump bed kits are available in 2 ton, 5 ton, and 7.5 ton models. Call Northern Hydraulics at 1-800-823-4937 for your best rate shipping quote on dump truck kits! Q. Will I have to raise my bed? A. With the 2T kit raising your bed is unnecesary. 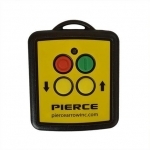 With the PIERCE 5 and 7.5T hydraulic dump bed kits you will be using a flat bed or dump bed and this requires raising your bed 2.5 to 3 inches depending on the truck. Q. How long is the install time? A. 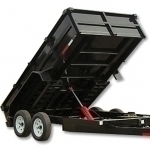 With experience a dump kit installation typically takes 12 to 16 hours. If this is your first time, expect to spend at least 16 to 24 hours of work to complete your dump kit conversion. Q. Where do I mount the pump? A. You can mount the pump at any location you desire as long as it is clear of any moving parts. Most installations have the pump mounted to the side of the frame behind the truck cab. Some people have even mounted it inside the cab.